IT’S NOT JUST A HAIRCUT. IT’S AN EXPERIENCE. Through the decades the modern man has suffered the loss of the quintessential neighborhood barber shop and its charismatic camaraderie. We invite you to reminisce about this rite of passage you share with your father and grand father. Visit Paulie's today to experience a professional shave/haircut the right way - done by highly experienced professionals and using classic Stephan products specifically designed for the sophisticated man. 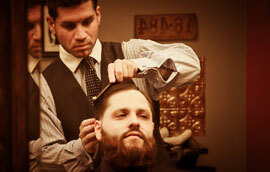 * We use Stephan's, Bay Rum, Island Lime, Witch Hazel and Lilac after your shave or haircut. * The chairs in the shop are more than 80 years old. You'll be sitting on true relics. * Kevin became a barber after playing soccer in Spain. Together with your input we’ll find a haircut for you, that promotes confidence of presence and nothing is more masculine than that. Set some time aside so you can come in and get a proper shave with sufficiently steamed hot towels pre-shave creams and post-shave menthol. 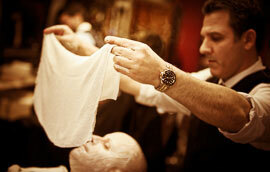 Enjoy a post-shave gentlemen’s facial using multiple hot towels and old-fashioned face creams. A very popular service on gentlemen’s wedding day!